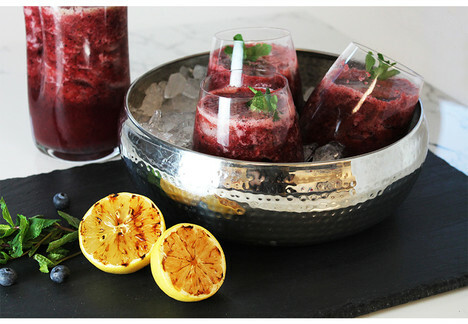 A refreshing probiotic drink with apple cider vinegar, apples, blueberries and grilled lemons. Preheat grill to high heat. Place lemons on grill and cook until slightly charred, about 5 minutes. Squeeze lemons over a strainer into a blender. Discard seeds, but add pulp along with remaining ingredients. Blend until smooth. Strain and serve chilled or over ice.